Overwatch is a truly dynamic game, which means there’s always something new going on behind the scenes or in the community. Each week, we’ll have a round-up of the latest game news. That might be balance notes, character rumors, esports announcements, or just unmissably funny gifs. Here’s what Overwatch fans need to know for the week of July 10. After much speculation and rumor, Doomfist really exists! The long-awaited hero is shaping up to be a powerful addition to your front-line combat options. 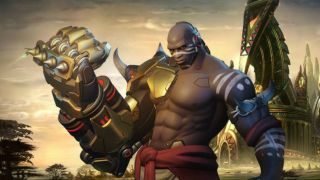 As you might expect with the launch of a new hero, the community has been talking a lot about how Doomfist will fit into the metagame. We’ll be reserving judgment until he’s been officially patched into the full game, just in case Blizzard makes any tweaks to his final build. What we are doing, though, is digging what we’re seeing of the Talon leader in action. First, a quick rundown of Doomfist’s abilities. His main weapon is the Hand Cannon, with ammo that automatically regenerates over time. It’s a short range weapon; he’s all about the melee. Rocket Punch is the alternate attack, and it can go through barriers like Reinhardt’s shield. Wind it up and charge Doomfist into an opponent. If you knock the target into a wall, Rocket Punch deals even more damage. Seismic Slam is a leap forward that pulls enemies towards him, while Rising Uppercut is a knock-up fist to the face. When he lands a punch on an enemy, Doomfist activates a passive ability that generates a personal shield. It lasts longer if you can land a chain of hits, making The Best Defense a great resource for the front line. Finally, Doomfist’s ultimate ability is called Meteor Strike, which lets him shoot upward, then crash back earthward to do a huge amount of AOE damage. So far, players are finding some great rotations for Doomfist’s abilities. One of the most exciting combos is just how mobile he is. Redditors are already posting new options for flanking routes that use his Rocket Punch and Rising Uppercut. The traversal options already give Doomfist an edge over unawares opponents. Once he’s in the fray, the sequence of drawing in enemies then knocking them out, all while protected with his shield, is a strong combo. Doomfist only has 250 health, so he’s pretty much in line with the squishiness of other offense heroes. And, unsurprisingly, his ultimate ability will make for some excellent kill streaks when paired up with his teammates. To wit, check out the massive wipe above with an assist from Zarya.